NS JTAG it's additional Box for extend supported functions of NSPRO to repair totally Qualcomm phones or repair boot area into these phones. TO this time it was not possible by any equipment - and now you can easily reapri any Zxxx phones by this tool. 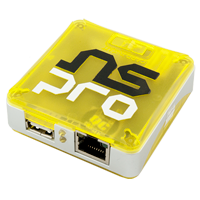 NSPro with 30 cables set it's best Professional Samsung software in the market and supported by the most reliable team, NS TEAM. New enhance security protection is implemented to assure investment protection. NS PRO utilize the latest smartcard security technology to insure a secure long term investment. In todays gsm market, a life cycle of a product is as long as the strength of the protection of the product itself. NS PRO will also implement a server authentication as an additional protection measure and increase level of customer service by providing regular update through the server. The server also provides instant broadcasting news for all customers. This way, software can be updated on time.